Where in WeHo Are Fists Most Likely to Fly? Assaults in West Hollywood from June 12, 2016, to Jan. 7, 2018 as mapped by Crimemapping.com. Numbers displayed on the chart indicate multiple incidents in the same location. Where are you most likely to find a fight in WeHo? In what places should you NOT park if you don’t want your car stolen? Where do the burglars find their targets? In coming days WEHOville will map out some of the more serious crimes in an effort to answer that question. 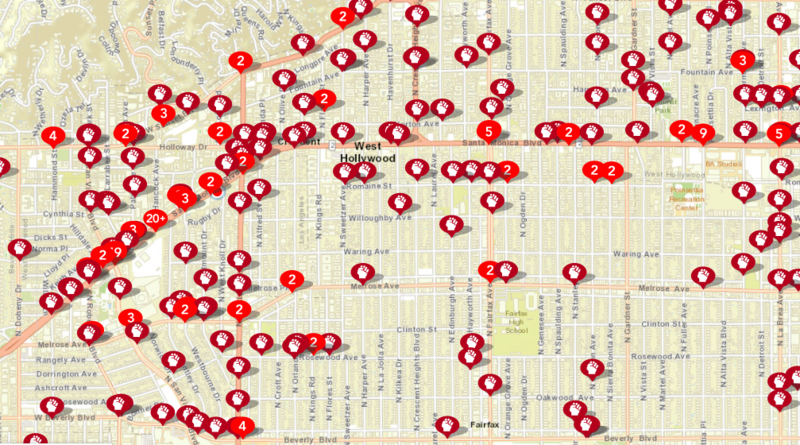 While the West Hollywood Sheriff’s Station issues weekly and monthly reports of serious crimes (which WEHOville publishes), aggregating them on a map gives one a better sense of where the problem areas are. The Crimemapping site is accessible by anyone and allows searches by ZIP zones, dates and type of crime. WEHOville tracked crimes in West Hollywood over the past 180 days (that’s as far back as Crimemapping allows one to go). The map on the top of this story suggests fists are most likely to fly in and near WeHo’s Boystown, the gay nightlife district on the city’s Westside. The 8700, 8800 and 8900 blocks of Santa Monica Boulevard are places where you should be extra careful. They accounted for 51% of the assaults along the boulevard from Doheny to La Brea during the 180 days surveyed. The 8800 and 8900 blocks, which run between Palm Avenue and Almont, are largely dominated by bars and restaurants such as Mother Lode, PUMP, Trunks, Flaming Saddles, Micky’s, Revolver and Bar 10, where you can consume alcohol. That’s where 35 assaults occurred, with 24 of them concentrated at the intersection of San Vicente and Santa Monica boulevards, the center of the bar district. The 8700 block from Westbourne Drive to Palm Avenue is home to a variety of businesses including Roast Corn Grill, Chop Shop, Tender Greens, Provo Pizza, Santa Palm Carwash and L.A. Buns & Co., with Gym Bar being the only bar. That’s where 32 assaults took place during the period surveyed. Most of those assaults (22) occurred at or near the intersection of Santa Monica with Hancock Avenue. Robertson Boulevard at Melrose Avenue, which one might consider an exit from the nightlife district and the 600 block of Robertson, is another area where fists fly, with 19 assaults. That block is full of bars and restaurants such as The Abbey, The Chapel and Sur. Heading east along Melrose to San Vicente, one finds another 11 assaults listed. Nightlife apparently is calmer on that part of the Sunset Strip within West Hollywood’s city limits. It was home to 22 assaults during the 180-day period. A deeper look into Crimemapping shows that most assaults happened at night, with a significant number of those in the early morning hours. There are two types of assaults. Non-aggravated assaults are those that don’t involve use of a firearm, knife or other dangerous weapon and in which the victim does not sustain serious or aggravated injuries. Aggravated assaults, which are much less common in WeHo, are those committed with the intent of inflicting severe injury. This type of assault usually is done with a weapon or some other device that is likely to produce significant wounds or kill the person assaulted. I think anybody with logic could have figured that out themselves.